Over the last few weeks I’ve heard about sweet corn ice cream several times, once on a morning show, once online and again on my favorite satellite radio show. With the abundance of the best corn in the world right around the corner (literally, in this case), I decided to use a lazy Sunday (normally an oxymoron) to branch out into the use of a vegetable in ice cream. How bad could it be? I love ice cream and I love corn. I have combined much more diverse foods before with grand success (egg salad and sweet pickle relish, espresso and chili) so, what the heck! I make a simple ice cream with two cups heavy cream, two cups half and half, good vanilla (let’s talk about good vanilla soon, ok?) and a can of sweet condensed milk. Forty five minutes of a slow churn in my Kitchen Aid ice cream maker and you’ve got a nice dessert. The sweet corn recipe called for heavy cream, milk, corn, egg yolks and sugar … simple enough. My first veer off the road was the milk. I purchased half and half and decided not to go back to the store. This may have been mistake No. 1. I sliced the corn off each cob and boiled both corn and cob in the cream mixture along with some of the sugar. I then used my immersion blender (a tool I have fallen in love with) and let the mixture steep for an hour. I was very careful to follow the recipe except I added vanilla because I thought it needed it. This could have been mistake No. 2. Next, I put the mixture back on the stove to bring back to a boil while whisking nine egg yolks and the remaining sugar. I tempered the eggs by adding a little of the hot cream/corn mixture while whisking very quickly to avoid making scrambled eggs. The custard was still looking good as there was no separation. I added the yolk mixture into the pot and whisked for about 10 minutes until the mixture looked thick and coated the spoon. 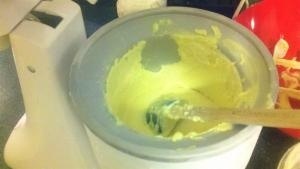 I passed the entire mixture through a sieve and put the custard into the refrigerator for at least four hours. Four hours later, I was asleep so letting it chill overnight seemed like a good plan. The next morning I set up my ice cream maker by inserting the moving paddle and securing it to my stand mixer. Now for mistake No. 3 (and this was the fatal error) of adventures of frozen custard. The mixer instructions are very clear about never stopping the churning until the ice cream is completely churned. I have made at least 50 half-gallons of ice cream and never had a problem but this custard mixture was so thick I was having a hard time getting it into the freezing cylinder. What did I do? Youbetcha, I stopped the machine and scooped the remainder of the custard into the freezer. And, that’s all she wrote. Frozen solid, the machine making a funky sound and my hours of work simply vanished. Later, when I could get the churn to move I let it churn again. However, the damage was done. I put it in the freezer and tasted it once it froze solid (and solid it did become because when you do not add the air to the mixture the custard becomes like an ice cube rather than smooth and creamy). I must tell you, the flavor is spectacular but the consistency is unpleasant. Because it did not churn, there is a milk fat solid feeling on the roof of your mouth (like when you eat butter, don’t even pretend you have never eaten butter) so I only have a spoon at a time (it will take some time to eat ma meestake). I intend to give this another try and I’ll let you know if I ever get a good final product. If you have ever eaten sweet corn ice cream or know a good recipe I would welcome the dialogue. When Publisher Tim Schmitt invited me to be a food and wine columnist for http://www.BelowTheFalls.com, I was flattered and nervous. Certainly he knew my degree was in accounting and my experience was sport management? Not to worry because he apparently wanted my enthusiasm, not my expertise. Enthusiasm he got … experience, not so much! OK, it’s warm. I get it. When it’s cold, you put on a sweater, but when it’s hot, unless you’re less than three feet tall and wear a diaper, you cannot walk around in your undies. Last night, I celebrated Wednesday with some wonderful friends on the patio at Water Street Landing in the Village of Lewiston. This location is shear perfection on a summer evening and the sun shining off of the Niagara River was a lovely distraction. The bar was not very busy, but a crowd is always expected after the free Artpark concerts on Tuesdays and Wednesdays during the summer. I had the pleasure of speaking to Water Street veteran Vinny Bevilaqua and relative rookie to Lewiston Mike Ciulkowski. They told me that a typical Artpark evening is steady before and “slammed” after. They see a cross section of patrons from the “still needing to show ID” crowd to the AARP partiers. 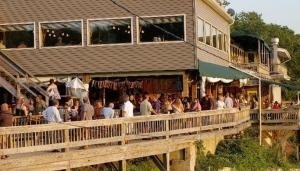 Mike likes a busy bar and finds the challenge of keeping everyone happy the best part of his job. Vinny says that everything is better with a view and I cannot argue the point. Vinny mixed a very nice Sea Breeze (Vodka, Grapefruit and Cranberry) and at $3 a drink you can afford a designated driver. The Madras (Vodka, Orange and Cranberry) is also a perfect patio drink. I had a big bowl of steamed clams and soaked in the view. As I watched the guys interact with the crowd I asked about tips. I’ve always been curious if there’s a typical profile of a good tipper. Mike says they are usually the ones you would not expect. If someone comes in with a flash and tells them they are going to take care of them, beware. They are usually the most demanding and least generous. Mike lets it slide off his back. Vinny, a graduate of Niagara University with a degree in political science and business, has a lot of regulars. He says the best thing about his job is the ability to network. He’s so good at it that he’s leaving Water Street to manage Legends Bar and Grill on First Street in the Falls. The Foodie, tipping her Sea Breeze (and her server), wishes him the best of luck. Farmers markets — what’s fresh today? Just a few months after turning 16, I passed my drivers road test. I remember is like it was yesterday. I borrowed my mother’s Oldsmobile Ninety Eight, picked up my friends Jolie and Kathleen and drove down Indian Hill to buy corn. My first solo spin was to Nichols Farm on Ridge Road where I also remember buying fudge. Do you remember when you could buy fudge at road side stands and it would be the creamiest fudge ever? I drove by Nichols Farm today and the road stand is long gone. 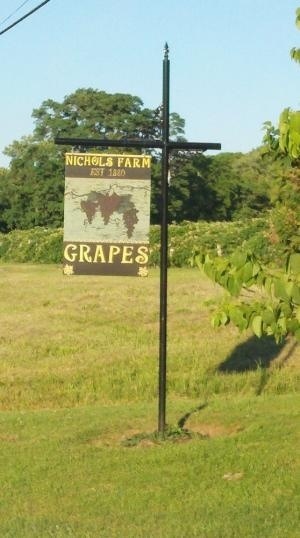 There is a sign saying they are proud Welch’s grape growers. That’s cool!Saturday morning, I left my house in sweats around 7:30 a.m., intending to drive through Dunkin’ in Ransomville to get some coffee because I was too lazy to make some myself. With coffee in hand and my sweet hybrid, I drove around northern Niagara County and discovered tons of road side stands. 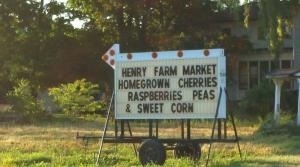 Henry Family Farm on Creek Road has their menu on their mobile billboard sign. Fresh cherries? Sign me up. Sanger Farm Market is just down the street from my neighborhood yet I did not know about it until my mother-in-law introduced me to this local gem years ago. She is a big fan of their pies and other baked goods. 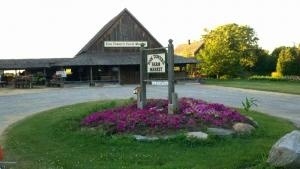 Perhaps the best known farm market in the area is Tom Tower’s. Tom looks and sounds like a farmer — a Cornell educated farm expert who can also teach you a thing or two about wine. I’m sure Eden corn is good but Niagara County corn is like butta! My mother-in-law has been known to drive up from Buffalo to purchase fresh peaches and other delights. There is a display near the old fashion cash register (the market workers have to know how to make change, a nearly lost art) that tells what is in season, what is past and what is not ready. If you go to these markets bring cash and a few bags. Also, it’s tempting to buy a lot but resist if you can. These fresh foods do not have the same preservatives we are used to and spoil quickly. If you can, shop like the Europeans, buying only what you can eat in a few days. Drive around and explore the bounty of Niagara. Happy Summer! Here is my plea: if you are a farm market, road side stand or other type of fresh vendor below the falls, feel free to contact me weekly by Monday with what is fresh that week. I will compile a list of markets and post a list every Wednesday until the snow closes you for the season. Please include your name, location, hours and top three fresh weekly offerings. Thanks!